00:39:00 Makes 4 servings, 2 kabobs (165 g) each. Makes 4 servings, 2 kabobs (165 g) each. 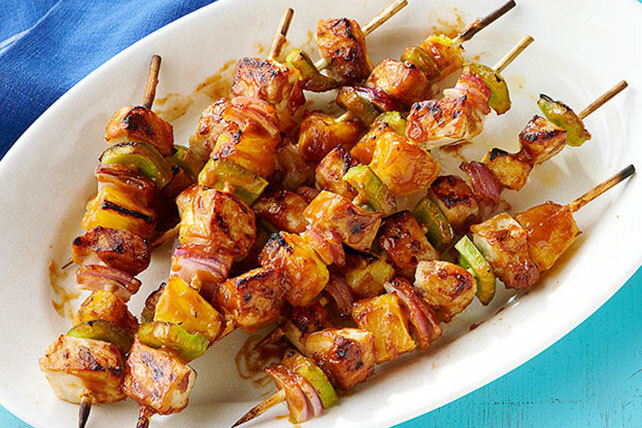 Fresh pineapple chunks add a touch of sweetness to these pork and veggie kabobs, while barbecue sauce and some time on the grill lend a smoky taste. Get grilling with yet another great recipe from the KRAFT KITCHENS - these Pork and Pineapple Kabobs are a must-try! Mix first 3 ingredients. Reserve 1/4 cup sauce for later use. Pour remaining sauce over chops in shallow dish; turn chops over to coat both sides of each. Refrigerate 15 min. to marinate. Heat barbecue to medium-high heat. Remove meat from marinade; discard marinade. Thread meat onto 8 skewers alternately with pineapple, peppers and onions. Grill 12 to 14 min. or until meat is done, turning occasionally and brushing with reserved sauce. Substitute 1/2 tsp. dried rosemary leaves for the fresh rosemary. Meat can be marinated up to 24 hours in refrigerator before grilling as directed. Serving Size Makes 4 servings, 2 kabobs (165 g) each.